High Point, N.C., generates billions in revenue each year by hosting two furniture markets. It's like Fashion Week for the furniture world. Twice a year, anyone who's anyone in furniture manufacturing and home goods gathers in North Carolina for the High Point Furniture Market. 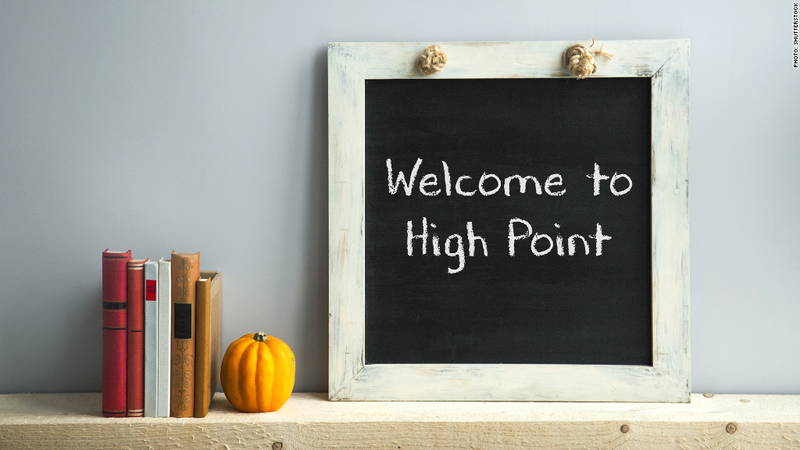 High Point, N.C., which has roughly 100,000 residents, nearly doubles in size for two weeks a year. The market hosts 75,000 attendees and 2,000 exhibitors for a week in April and then again in October. It brings $5.4 billion into the local economy -- and creates over 20,000 jobs. "I can't imagine what the area economy would look like if we didn't have the market," said Tom Conley, CEO of High Point Market Authority. Ray Wheatley and his wife Lisa own the Real Kitchen & Market, a High Point catering business. On a normal day, they have between 75-100 customers (usually picking up food for their families). During each market, they feed roughly 15,000 people. As a result, sales during the two markets account for roughly 25% of their annual business. But despite its success, the city is constantly fighting to keep High Point's 106-year-old foothold on the market (especially as major cities like Las Vegas have begun hosting their own). That means improving services that might come naturally for its big city competitors, like public transportation and improved bus terminals. "Probably our single biggest challenge is to find ways to keep the market alive and keep it dynamic and to attract new people," said Conley. North Carolina appropriates $1.2 million for transportation and $650,000 for marketing each year, according to John Faircloth, a member of the North Carolina House of Representatives. This has been key to keeping the market running smoothly -- and accommodating its out of town visitors, who account for over two-thirds of attendees. They stay an average of five days and spend $450 million annually on everything from lodging to dining to entertainment and parking, according to a 2013 survey by Duke University. Related: Is your city the next Portlandia? Len Burke, vice president of Klaussner Home Furnishing, says the market is a valuable investment. The company used to showcase items at its 100,000-square-foot showroom in Asheboro, N.C. (just a 30-minute drive), but they've rented out a showroom in High Point since 2010. Even though they only need it for two weeks, the lease runs all year. But Burke said it's worth the cost, especially since the market brings in a number of international customers. "We spend millions of dollars a year investing in that market," said Burke. "We lease a parking garage to let customers park there. We feed them breakfast, lunch, afternoon cocktails, provide shuttle services." While he wouldn't disclose what their return is, he said it is definitely worth it. "I'm already planning next April."